While watching the Emmy Awards one would expect to see some of the greatest talent in entertainment take to the stage and prove why they are nominated, or presenting, or deserving of being at the show in some other capacity. 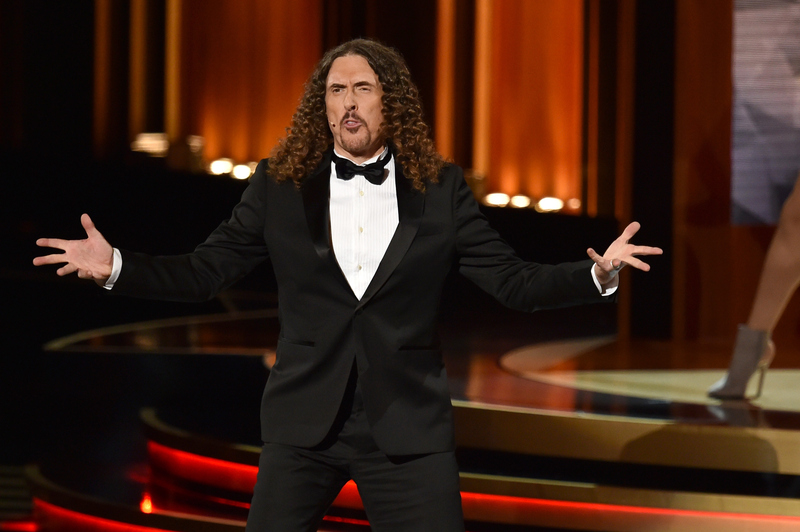 But Monday night's show brought a surprise: Weird Al Yankovic’s Emmys performance in which he parodied the theme songs of nominated shows. There were probably a lot of emotions running through your head when you saw Weird Al take the stage. First of all, why is this happening to me? What did I do this far in my life for me to deserve sitting through Weird Al "singing" television themes? Second, has Weird Al ever actually seen any of the shows he is singing about? (I’m made the quick decision and said, "no.") Third, are those Beyoncé’s VMA dancers in the background of the Mad Men segment of the song? Unfortunately, they were not, and Beyoncé didn’t come and save the song. But thankfully, Andy Samberg did. First, Yankovic sang about Mad Men. It was about as detailed as one could get from reading the intro of the Mad Men Wikipedia article. Jon Hamm received a little roast during the verse, when Yankovic sang, "John Hamm’s never Won and Emmy/Oh, who cares, he’s still Jon freaking Hamm." And THAT is something Weird Al and I do NOT disagree on. Next, was Scandal and while Weird Al’s dancing got a little more scandalous, the lyrics just got a little, well, weirder. But if there was one thing Weird Al did know about Scandal, it was that Olivia Pope’s quivering lip CAN NOT QUIT. He did sum up Homeland pretty well with the lines "making out with terrorists," but the standout was his shoutout to Mandy Patinkin with "Inigo Montoya grew a beard." If there is anything you should take away from Homeland it should be that The Princess Bride’s Inigo Montoya now has a beard. Confirming my second question of the night, I don’t think Weird Al has ever seen Modern Family because his lyrics included the very obvious line, "It’s Modern Family," but I guess sometimes you just have to go with the simple take on things. I do have to give Weird Al for credit for that high kick. Finally, we got to Game of Thrones, which completely made up for the minute of song and torture, er, dance that we had just watched. George RR Martin made a cameo as he typed away new scripts while sitting in his seat on a typewriter! That’s right, more Game of Thrones. Type away, George. Type. Away. If you want to watch the entire thing in its ridiculous entirety, check it out below.